Pir Mehr Ali Shah Arid Agriculture University Rawalpindi Jobs March 2019 is offered by the organization of Dawn Newspaper JobsGovernment JobsLecturer JobsMedical Officer JobsPir Mehr Ali Shah Arid Agriculture University Rawalpindi JobsProfessor JobsPunjab JobsRawalpindi Jobs. The Working hours for Pir Mehr Ali Shah Arid Agriculture University Rawalpindi Jobs March 2019 is 8 hours a day and 40 hours a week. So, Pir Mehr Ali Shah Arid Agriculture University Rawalpindi Jobs March 2019 is a fulltime job. 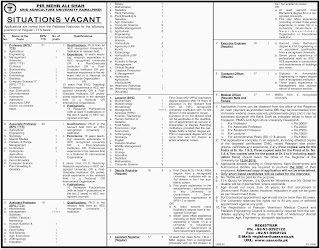 The advertisement of Pir Mehr Ali Shah Arid Agriculture University Rawalpindi Jobs March 2019 contains complete information about job specifications, job description etc. which is published in Different Newspapers dated March 20, 2019. The complete information about Pir Mehr Ali Shah Arid Agriculture University Rawalpindi Jobs March 2019 is at this page. Various positions are vacant for right individuals. The applicants must be suitable as per job advertisement. The positions of Professor, Associate Professor, Assistant Professor, Lecturer, Deputy Registrar, Assistant Registrar, Executive Engineer, Transport Officer, Medical Officer are currently vacant. The candidates who intend to apply must read job advertisement which contains all information about submission of applications. The last date to submit applications is 15th April 2019.